Family migration is sponsored by the second most substantial migratory flow of Australian visa programs. You can quickly move To Australia as a permanent or temporary resident, as long as you have a cousin or partner in Australia, an Australian citizen, a lifelong resident in Australia or an eligible New Zealand citizen. Unlike skilled migration, a candidate does not have to comply with a test of accuracy. Age is not a criterion in most cases. All the required applicants are eligible sponsors for Australian Migration. This visa is for Australian citizenship, permanent resident or new citizen of New Zealand who intends to enter Australia or by marriage or de facto relationship with their partners. Your visa is processed in two phases. The applicant will first be granted a provisional visa until the decision on a Permanent Visa is issued and the applicant is finally allowed to apply for a visa if he still meets the visa requirements. The basic requirement is to obtain the sponsorship of an eligible sponsor The applicant obtains a permanent visa in certain circumstances in which the applicant can prove that he or she is married or in a de facto relationship with her partner for five years before submitting the application or request. The relationship existed two years before filing the claim, and there are children born of their relationship. Sponsorship: The applicant must be sponsored by an eligible Australian citizen, permanent resident or New Zealand citizen, and the sponsor must sign an obligation to provide financial and social assistance to the applicant while in Australia. Health requirements: the applicant must comply with all health and fitness requirements by Australian legislation. Social Security Unit: the applicant or sponsor must be supported by assistance insurance if it is likely to become a beneficiary of Australia's social security system. They can include supporters in the application until they meet the health and character requirements following Australian law. An applicant who intends to move to Australia for reasons of marriage must contract a legal marriage, must lawfully marry the applicant before deciding on a temporary visa. The applicant and his partner must have a genuine interest and a mutual commitment to achieving their relationship. The plaintiff should have been in a de facto relationship with the promoter during the 12 months preceding the filing of the petition. This is a visa for people who want to enter the country within nine months after entering the country to marry their intended partner, an Australian citizen, resident or New Zealand, eligible citizen. The applicant must enter the country at least once before marrying for the desired partner. Once the FiancÃ© visa has been approved, the applicant can finally apply for an association visa paving the way for a Permanent Residence Visa in Australia. You can include family members in the app as long as they meet the health and character requirements of Australian law. The applicant and the desired partner should be known as adults. 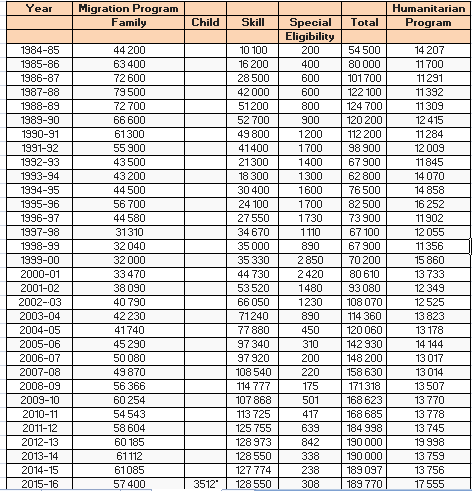 Permanent Migrants Table Overview: Australia Family Immigration and humanitarian program visa grants since 1984 - 85 to 2015-16. The visa options for parents are for people who intend to move to Australia and live with children who are Australian citizens, permanent residents or eligible New Zealand citizens. You can sponsor people for a permanent stay (depending on the waiting periods). These visas are widely divided into two groups. The Parental Migration Program is being designed by the Australian government to reunite family members living in different countries. This is a permanent visa option available for parents sponsored by their children living in Australia. The applicant must undertake to provide insurance support. The Australian Government's cap on parental visas leads to more extended waiting periods. a) A Working Age Parent (Subclass 103): This visa is for non-Australian persons who are not of Australian pension age and who complete the rest of the family tests. b) Senior Parent Visa (Subclass 804): This visa is for persons in Australia who are old enough to receive an Australian pension plan and who complete the rest of a family test. The applicant's age must be over 65 for men and over 63 for women. This category was introduced by the Australian Government to reduce migration lag in the main class. These visas are for parents with Australian children and rely solely on their children for financial support. The permit of the parents is allowed once or twice to the Permanent Residence. Initially, the applicant will receive a temporary visa for two years, and later the applicant can apply for a permanent parental visa with a contribution. The requirements and vision of the parents and the vision of parenting contribute are the same. The only difference is that parents have to make a more significant contribution to their future health and social costs. The basic requirements for both visa categories are the same. Sponsorship: The applicant must be sponsored by his / her child or an accompanying child who is an Australian citizen, a permanent resident or an eligible New Zealand citizen. Provision of support: the claimant must be insured by a person (not necessarily a sponsor) for two years in the case of a father's vision and ten years in the case of the birth certificate of the parents. Waiting Periods: The Australian Government restricts the number of seats available for home visas in each year of the program, resulting in longer waiting times. The number of places available to taxpayers for parents is quite high about the visa category for parents, but parents should make a more significant contribution to their future health and social costs. Health and character: Applicants must respect health and character requirements following Australian Laws. As part of a Family Immigration Program, the Australian government has introduced visas for children who help Australian children move to Australia and live there indefinitely. The primary requirement of this visa must be sponsored by parents who are Australian citizens or permanent residents or eligible citizens of New Zealand. This visa entitles children to stay permanently in Australia provided the parents of the child are citizens of Australia. The primary requirement of this visa is to get parent sponsorship years of passage can be added under the visa scheme for the miners, if the age of the applicant is under 18 years of age, and the sponsor is already a partner of the child's parents, the legal responsibility of the care childish. This is a permanent visa for a foreign child younger than 18 years of age whose parents permanently died or whose place is unknown. This is a permanent visa for foreigners. This is a permanent visa for children from abroad who are adopted or will be admitted by an Australian citizen, lifelong resident, and eligible New Zealand citizens. The responsible state or territorial authority (STAA) must be involved in managing the adoption process with the foreign country where the child lives. The applicant must stay out of Australia when submitting a visa application. Children under 18 whose parents have died permanently or are unknown. This is a temporary visa that is offered to children whose partner is a temporary visitor and is valid until a decision is made about the vision of a permanent companion. Age: Age of applicant age must be less than 25. If the applicant is over 18, he must be a regular student and must be entirely dependent on his / her parents for financial support. Australia Statement of Credit: All applicants 18 years and over must sign the Australian Declaration of War. Other family visa options are available to dependent elderly persons, to the remaining parents and caregivers of Australian citizens, permanent residents, and eligible New Zealand citizens, allowing them to live permanently in Australia. The basic requirement of all these visa categories must be sponsored by an eligible family member in Australia. Sponsor: The applicant must be sponsored by a close relative who is an Australian citizen, permanent resident or citizen of New Zealand who meets the conditions. Family in Australia: The applicant must have a relative, parent or cousin in Australia who is an Australian citizen, permanent resident or a New Zealand citizen who meets the conditions.